How to make chicken gravy is a question you may have asked yourself. Making homemade gravy isn’t difficult to do. It is actually fairly easy. Whenever I bake up a chicken, I am always thinking of preparing mashed potatoes and some homemade chicken gravy. I have such fond memories of Sunday dinner at my grandmother’s house and chicken dinners were very common. If you want to try an easy baked chicken, be sure to try my chicken recipe. 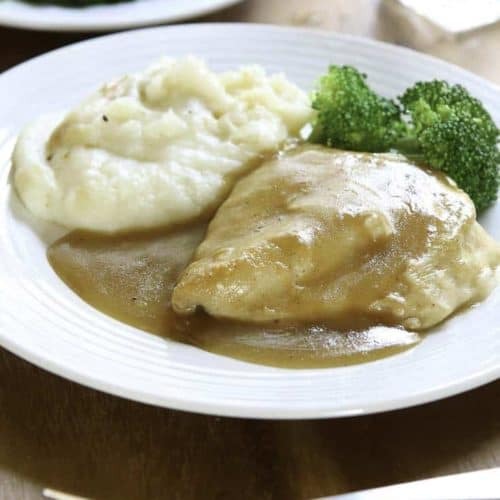 How to Make Homemade Chicken Gravy – it’s super easy! There are actually several methods of making a gravy. I am going to show you what I think is one of the easiest ones to make and one that practically seasons itself. This style of chicken gravy is the one to make after baking a chicken. Since you baked your chicken, you have already seasoned the bird perfectly, and you have flavorful pan drippings that are just crying out to be made into gravy. When it comes to which liquid to use in your gravy, you can use chicken stock as I do in this recipe, or you may want to use milk instead. Sometimes you don’t have to happen to have a freshly baked chicken to have pan drippings, you can make chicken gravy with chicken broth. We can all agree that making chicken gravy from drippings is the best way to make gravy. If you don’t have drippings, you can start by making a simple roux out of flour and butter, and use either chicken broth or chicken stock for the base of the gravy. Chicken gravy made this way can be very flavorful and better than any gravy you would get from jar or make from a mix. 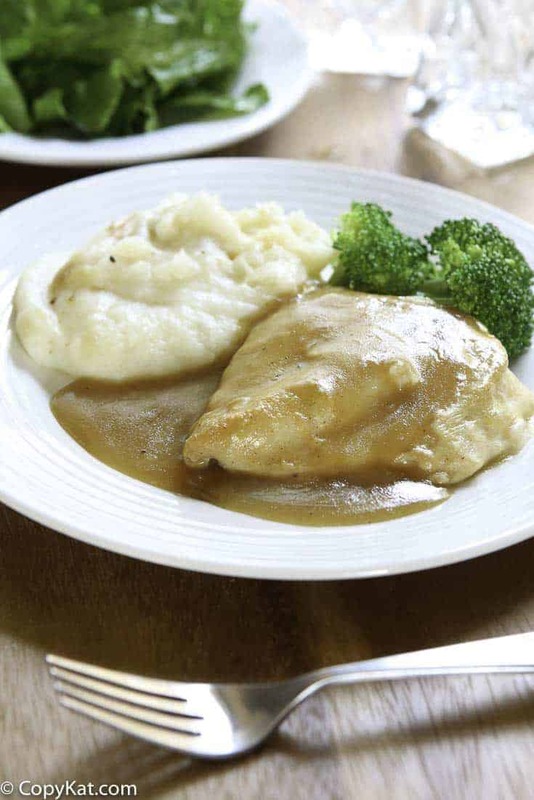 Learn how to make delicious chicken gravy from scratch with this easy recipe. Heat the pan drippings in a skillet over a medium-high heat. Whisk in the flour to make a “roux.” Cook this roux for a minute or two to remove any raw taste of the flour. This is a critical step, so make sure you have cooked this for at least a full minute before adding the liquid. Add one-third of the liquid and whisk together. This will turn very thick after a moment or two. Add the next third of the liquid, and whisk, making sure all lumps are removed. Once this has thickened fully, you can add the remaining liquid. If your gravy is too thick to your personal liking you could add some additional liquid, or even finish with a tablespoon or two of heavy cream if you desire. Use LACTOSE-FREE MILK… There are are TONS OF DIFFERENT NAME BRANDS OUT NOW! So choose ur special kind and go! I’m sure you can even use the NEW LACTOSE FREE & GLUTEN FREE KIND they have out now! It’s NOT REAL THICK THOUGH! But, tastes good & have it in “Almond Flavor!” Which actually gives it a nice flavor! I made this gravy according to your directions and it was lovely, so much better than gravy powder from a packet and this is my gravy recipe now when I roast a chicken. That’s what I am aiming for, I want to show you how you can make everything at home. When we cook at home it is almost always better. I have made chicken gravy since I was probably 10 or 11 and I can tell you unless I am baking a chicken I do not use chicken broth. I love pan gravy, drippings, flour, s&p let it cook a bit to get a good rue then add milk and stir til thick. To me that is real chicken gravy, unless, as I mentiion the chicken is being roasted but no one should use chicken broth with good ol’ pan fried chicken all those great bits of crispies to just add to that great flavor!! Love reading your recipes and make many of them. Thanks, just wanted to add how quite a few of us like our chicken gravy too!! I am a big lover of good ole’ pan gravey with the flour rue and milk. Some people are across intolerant. Your recipe would not work for them. Besides, it’s always good to teach people different ways to do things, so they can decide what way works best for them.